Despite its small size and limited natural resources, Liechtenstein has developed into a prosperous, highly industrialized, free-enterprise economy with a vital financial service sector and likely the second highest per capita income in the world. The Liechtenstein economy is widely diversified with a large number of small businesses. Low business taxes - the maximum tax rate is 20% - and easy incorporation rules have induced many holding companies to establish nominal offices in Liechtenstein providing 30% of state revenues. The country participates in a customs union with Switzerland and uses the Swiss franc as its national currency. It imports more than 90% of its energy requirements. Liechtenstein has been a member of the European Economic Area (an organization serving as a bridge between the European Free Trade Association (EFTA) and the EU) since May 1995. The government is working to harmonize its economic policies with those of an integrated Europe. In 2008, Liechtenstein came under renewed international pressure - particularly from Germany - to improve transparency in its banking and tax systems. In December 2008, Liechtenstein signed a Tax Information Exchange Agreement with the US. 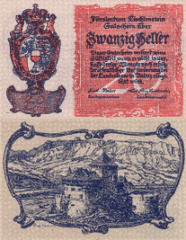 Upon Liechtenstein's conclusion of 12 bilateral information-sharing agreements, the OECD in October 2009 removed the principality from its "grey list" of countries that had yet to implement the organization's Model Tax Convention. By the end of 2010, Liechtenstein had signed 25 Tax Information Exchange Agreements or Double Tax Agreements.